In the year 2000 I moved from my secure, joint-family, small-town setting to become a student of a reputed college in New Delhi – raring to go, promising to make the best of hostel life and continuing wide-eyed in this big city with flyovers, McDonald’s and something called pubs. As a part of Delhi University rules, every student enrolled in the Bachelor’s programme had to give a certain number of hours to social work to get their degrees at the end of 3 years. This idea was run under the National Service Scheme (NSS) and while some colleges simply handed over the certificates, mine made us do our bit, every minute of it. Most of us cribbed. It involved our meagre pocket money being spent on commuting to far flung places and spending free time earning good karma - something which we considered ourselves too young for. Out of the array of activities, I picked teaching in a Jhuggi Jhopri Shishu Mandir about 8 kilometers from my college hostel in South Delhi. And 40 hours in a month is what I had to complete, which meant going everyday for an hour. Once I got over the idea of being stared down as I entered the slum cluster and learnt to ignore the catcalls welcoming ‘madam ji’, I started enjoying the teaching greatly. A class of about 60 students, all 4-6 year old in their dark blue and white uniforms would welcome me with a sing-a-song ‘Good morning’ and repeat their letters and numbers after me in the same sing-a-song voice. It was tough, to make them sit still on the mats and listen. All they wanted to do was dance to songs they sang themselves. A few days into it, and I started a story telling session, where the last 15 minutes of every class were to be spent in sharing personal tales. I had noticed a few children never participate and while I did not want to force them to, I thought this activity might interest them. I was not prepared to hear what I heard. “I don’t talk to him because his father came to kill my father with a knife one night, because my father stole a fish from his stall” – said a boy with an Om tattooed on his wrist, telling me why he refuses to sit next to the other boy. “Her mother is a prostitute. Everyone knows that. Other women are saying she is a witch too.” – said an older looking girl pointing at a little one sitting in the back row with an angry scowl permanently etched on her brow. “You see that girl in the corner? We don’t sit with her. Her father does dirty things to her. She is very dirty and if we sit with her, our father will also do those things to us. So our mothers told us to keep away from her. Maybe she also does dirty things to her father.” – giggled a couple of boys and girls together, completing each other’s sentence with a misfit excitement punctuating their sentences. I looked at her, as she fixed her gaze on the floor with a steely tenacity. That explained why she always sat alone, opened not her mouth and did not participate at all. She sat right there and her moving shoulders told me she was sobbing, something I had noticed so many times before without realising that this little 4-something girl has been crying all this while, even as the rest of the class sang ‘A sey Anaar Aa sey Aam’. "I know, beta. It has been going on for a very long time. We can’t do anything about it. These slum dwellers are like that. Let’s just do our jobs and not get personal. It’s none of our business. Plus, we have so much to worry about anyway. She sits here till I close the premises to leave around 4 pm. Then she goes home too. She is usually the first one to arrive." I wonder what shocked me more. The reality of the girl’s sexual abuse at the hands of her own father or this principal’s complacency and acceptance of it as something we cannot and should not do anything about. Back in college, I related the story to a professor who took it as seriously as it was supposed to be taken. She visited the Shishu Mandir with me, called the girl’s mother and asked her what this was all about. The mother, shuttling between sobs of helplessness and determination to not let us interfere in her household matter told us this – "Yes, he does dirty things to her. Every day. So, what can I do? He’s the father. We have nowhere to go. If I leave him, this girl will die of starvation. At least this way she is fed and even studying to become successful one day. I just look away, even if she calls me for help. What can I do? The neighbours saw him fondling her once and the word spread. Thank God we were not excommunicated from the jhopris. Where will we go? Maybe it’s just a bad habit of my husband’s and it will pass. I hope it does. I do want it to stop. I have told her to stay in school as long as possible. I hate it too. I try to stop him. But then, he is feeding her, educating her and getting her new dresses too. What more should I ask for?" And the girl still sat in her favourite corner, with her shoulders moving, knowing what her mother was talking about, re-living it in her mind as she did on her body, day after day. 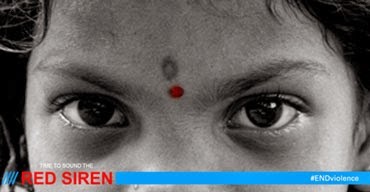 My professor contacted an NGO which worked for the rehabilitation and care for the girl child. After many meetings and even a little force, the father admitted to his crime and agreed to undergo counselling, between bouts of crying. My 40 hours of teaching were over, but this horrific story became a permanent chapter in my book of learning. I remember asking after Sapna from a junior who was assigned the same Shishu Mandir for NSS but she had no such student in her class. A year had passed already. This is the first time I share this story. Thanks to Rekha’s and Roshni’s blog posts spreading awareness about Sexual Abuse and the Girl Child, as part of Time to Sound the Red Siren Campaign by UNICEF India and Protsahan. As I look back with the eyes of a 30 year old mother and not a 17 year old teenager lost in a big city, I understand so much more than I did then. I see and read how sexual abuse is usually at the hands of a person known to the victim, say the father of the girl in this story. How, knowingly or unknowingly, we become abettors in the crime, like the girl’s mother, the principal, the whole jhuggi community and even those little children. Most importantly, I see how there is always recourse and hope, considering that Sapna’s father shamefacedly admitted to the crime and willingly sought counselling to stop his ‘habit’, something that seemed to be a burden for him to carry too. Be it making noise on public forums or whispering it in responsible ears, anything can help in stopping sexual violence against the girl child, or any child. It takes very little, and what it takes is well worth it! Sakshi I don't have words...I have a lump in my throat. We read it in the newspapers but actually having to face such a situation in reality can be so terrible. Thank God you approached for help! This is what is required of the society, to not ignore the situation but to handle it empathetically! It was terrible, Aditi, but nothing compared to what that abused 4 year old's mind must be facing day-after-day. Thanks for stopping by. Sad story. Real story. This is reality of many girls. These people from lower socio- economic strata live in our backyards. We generally do not care about there lives. We forget that their lives are as real as our with similar sorrow, misery, torment and may be occassional happiness. I do not have solution. I wish success to anyone that has. The strange bit is, Abhijit, that we DO have the power to better their lives, more than bettering those belonging to our/other strata of society. We just never bother. If anything, we blame them for every crime committed/not-committed. I wish I had a solution too. Sapna was just one of them. God, what a story and what a disturbing reality ! Yes, we all know it exists as we come across daily in the newspapers but seeing it in person, might have made it all too real and horrific ! I admire that you did not let the matter rest after talking to the principal and do what was needed to be done ! This story also brings forth a very important aspect - that people who indulge in such behavior also need help, are sick in the mind..something that is not generally acknowledged. I am glad you picked this - "that people who indulge in such behavior also need help, are sick in the mind..something that is not generally acknowledged". There are more psychiatric disorders than are known/acknowledged by us lay men. Perhaps, seeking professional help in time helps. Bravo Sakshi! Hats off to you for not taking the easy way out of ignoring that poor child'd trauma. This is indeed disturbing and I hope that the fact that light is now thrown on these dark facets of Society will help to reduce if not eliminate this menace. Actually, whatever we can do - write, share, spread the word, educate our children at home, etc, is this 'light' you speak about. Aiming at reduction is the first step. It's a malaise very widely spread. No words... very sad to know this. I am wondering why it is happening again and again with many of us? Where is the fault? In judiciary? in governance? in family system? in education? in social life? in religion? May be we have fault in all of these... It has gone so deep, that over night solution is not at all possible. May be value-based education at schools and in the family can bring some respite in the future!!! But, with the present set-up - I doubt! Lets try our best! I agree. Overnight solution is impossible and it may take years upon years to curb sexual violence. But then I am with you when you ask all those questions - Is it law, governance, family, education, religion? I think it's a mix of all, the wrong mix. But for ANY problem that besets us as a society, I cannot say this enough - Charity begins at home. We do need to introspect, find where we went wrong and stop looking for scapegoats outside our homes to lay the blame on. That really would be doing 'our best'. Horrifying, horrifying, horrifying. Not just this one incident which is terrible in itself, but when you imagine this compounded over millions of jhopris in hundreds of thousands of slum clusters all around the country. Unfortunately, all we are doing as a society is trying to stem a flood with the palms of our hands. I just hope that that little girl saw a better future thanks to your decision to take the matter seriously. By the way, I didn't mean for it to sound like this problem was limited to the slum dwellers or the poor. This scourge exists everywhere. This scourge exists everywhere. 'Monsoon Wedding' the movie? Plush Punjabi setting. It is exactly as you say - "stem a flood with the palms of our hands". Sad part is, mostly, the flood is not even visible. Thanks for your comments, Rickie. Sick ! Sick ! Sick ! You took a stand and tired to help the girl. And that is so commendable Sakshi. I hope the girl went on to have a bright future ! I hope so too, Ruch. Maybe today, I would have done better, faster and with more finality and closure. I do hope I never have to hear/see/read of such crimes against children, ever. Scary! What would have been the mental condition of the girl? Poor thing. I hope she managed to complete her education and get out the hell. As Rickie mentioned, it is not limited to the uneducated or financially poor segments of the society. It is very much prevalent in the educated and financially sound families too. All I wish is it should not happen to any child at all. You did a great job alerting the professor and a big thanks to her for ensuring remedial measures. Great post and thank you for the mention! "All I wish is it should not happen to any child at all. " - My wish too, Rekha. Thanks for reading! All this time while reading it, I had goosebumps.. This is so grotesque and horrifying.. And I am so proud of what you did.. Not turning a Nelson's eye to something that needs utmost attention. Kudos! Thanks for stopping by, Upadhi. Given that you were only 20 something when this incident happened, kudos to you and the courage that you showed during this entire episode. Despite the fact that you had led a sheltered life and had nothing personal at stake in this matter, the fact that you brought it up with the concerned authorities and escalated the same when they didn't respond as they should have speaks volumes for not only the kind heart you have, but also for your steely resolve. I cannot think of any other person that I know of offline or online who would have dared to do what you did. Really feel proud to say that I know you Sakshi, really do. Jairam, not so much about me being 17 but the girl being 4. I did what I could. I wonder if it made any difference at all. No closure to this episode of my life, actually. Sad. Oh Gosh, Sakshi! I was horrified while reading it and really admire you for persisting with reaching a solution. Like you pointed out, each one of us is an abettor when we allow the status quo to continue without ever trying to find any solution. I am so proud of that 17-year-old teenager who did not push it at the back of her mind and tried to improve the girl and her family's lot. Yes, sexual abuse is a reality. And spreading awareness and talking openly about it helps us understand it better and work towards stopping it. 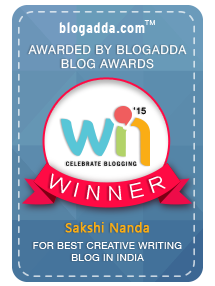 Thank you for writing the post and for sharing about Sapna! You came as a ray of hope in her life. I hope more of us can do what you did, Sakshi! So proud of you! I hope that really was a 'solution', Rachna. It's been 13 years, and I still don't sit convinced that Sapna is Ok. Perhaps, the daily news will never let me believe that she is Ok and 'successful' as her mom hoped her to be. Look around. It's a bad world. Getting worse even as we sit writing this. It's sad and very worrisome thinking this is the world our own children have to manage in. Yes, you are right! Who knows what could have transpired later. My maid was telling me that they all get their daughters married off at a young age because they are unsafe in their homes even from their own husbands, relatives or men in the slum. How can we blame them? And once married off, most of them suffer beating and sexual abuse. It is so horrifying. But it is not restricted to their strata. What the newspapers bring to fore gets grotesque with each passing day :/. No, we cannot blame them. A mother cannot think anything but the best for her children. Sometimes, I get amazed at the levels of socio-cultural difference we humans exist in. The newspapers are like books of horror tales. No surprise then that people want to leave the country and never come back. Horrifying it was, just like all the stories that we read in the papers, daily! Thanks for stopping by, A Homemaker's Utopia! What a frightening story. And as you said people accepted it as something they could do nothing about. I'm glad you did something about it. You just proved that those who want to do something just do it and those who don't, just make an excuse. I am shocked and in tears, have a 4yr old kid and I know what innocence they have - how do we stop these things? Tougher laws? not sure- it is generally the mother who let these things happen. I am ashamed to be a man for the first time in my life. May god give the strength to the small girl to grow up and become a better person and escape from the hell called home. I admire your courage and conviction of thought to at least put an end to this specific case. You need not be ashamed. There is no generalisation contained in these cases which pronounce a certain gender as bad in its entirety. You are shocked and in tears reading what I relate and that shows you needn't be ashamed. I wonder if the case actually "ended". I have no final word of closure to this episode. I just did what could be done then. I have a four and half year old daughter and i cant imagine how such a small and innocent girl must have carried on living...I hope that child wherever she is, is in safe environment. It's very frustrating and very depressing.. May these kinds of posts multiply and more and more NGOs take up this task to safeguard the little ones and stop this abuse.. I want to reach out, but to be very frank there is nothing much I can do, but will make sure that the neighborhood is safe for children.. Keep up the good work. Thanks for telling the story but I dont agree that such behavior is "disease".. Child abuse is crime and needs to be handled in that way . Counselling the person just does not seem to be apt thing. There are millions such untold tale of horror and if we want this to stop, we have to act. Lot of people hear and leave it as "non of my business" . Thanks for not resting till you did your best. I still think this calls for serious punishment, this is not "OK" and no justification is should be considered. Brilliant work and I hope you continue to do it. It certainly is not OK, Deepti. And I wish I, or the others around me, knew more about the how to/what to of such a situation. I left the story at a point when the said NGO took over the case of this sexually abused girl. The lack of closure bothers me too, especially since I did get emotionally involved in the episode. I think this, as well as many other crimes, call for serious punishment, even if the root cause is a proven medical illness leading to such depraved acts.Thanks for stopping by, Deepti. I am in utter shock.. totally horrified. Not that I heard something like this for the first time.. but no matter how many such cases emerge, the intensity of my emotions keep growing. I have no other words to what I want to say... though I have so much to say. You write so beautifully, Namrota. I am sure you will be able to convert your emotions and thoughts into a piece which we can share for all to read, and learn from. :) Thanks for stopping by. Education! That's the only solution to redeem the society...not castration,not death penalty; Educate people! Hi, Was horrified to hear abt the girl's story. Really glad you intervened. I hv done masters in psychology n one of the things tht we learnt ws tht pedophiles r more or less beyond reform. I doubt thus her father would hv changed n hope she is in a better place now. Hi Sakshi, thanks for sharing your experiences. To begin with, Sapna's story did not shock me, have worked with a couple of NGOs and have come across such stories from the NGO volunteers. What shocked me and enrages me always is the indifferent attitude of the so called 'educated, elite' class. More so when their response is the stale - 'What can we do?' Imagine a school principal saying that. All his/her degrees and teaching experience is a waste. We can do so so much - like you did, to intervene or to get people who matter to intervene and take matters in their hand. I wish there are are volunteers who go all out and educate children about their rights, and tell them to speak out. There's so much to do - create awareness, educate, educate, educate...then there's this huge issue of sexual education for both children and adults...sigh...feel so sad and helpless about that little girl right now. O my God! I don know what to say but it is extremely sad. Intervention is very important to stop the crime - what u did! Hope that girl does well in life! I hope so too, though I have no clue what became of her, or of so many in her shoes living through hell. Thanks for stopping by, jingles!! First of all, I need to thank you.Not just to share story like others but help the girl. And also this is not bracketed to jhuggi jhopdi, even high rise have such misery too.You will not get their side of story because they know covering up skills. My heart goes out to all the helpless Sapna and wish they all find saviour like Sakshi in their troublesome life. I'm so happy that you spoke up and that your professor and you actually did something about it! Shame on the principal for her complacency!! Just unimaginable!! And this complacency we will find reflected in most people around. And then we think criminals are only lodged in jails. :) Thanks for stopping by, Roshni. The harsh realities of life is there right in front of us, but we choose to ignore it. I remember one of our top Bollywood actor's comments when Slumdog Millionaire was released. "This is not the India that has to be showcased to the world" What he meant in other words is "let us sweep it under the carpet as if it is not happening"
Such a terrifying story but am glad there are still people like you and professor. It’s so devastating for the child. I still remember the horrifying news few months back, about how the perp had inserted a plastic bottle and candle inside a four year old. She has gone through numerous surgeries but will it heal the trauma the child has gone through? Will she able to lead a normal life? It’s sad and shame. Security and safety for females in India are merely words left. There is no security for females, and not even for children - both sexes. The sickness that perhaps once went unnoticed or remained repressed is coming out now. The newspapers are full of horrifying stories I don't want to read and every second house has had cases of violence (emotional, financial, physical) against women. It is sad and shameful. Thanks for reading! Sakshi thanks so much for sharing this. This is so disturbing and scary. Really Really Good job. Every time I am scared. Thanks for sharing. I just sit thinking what must have become of her. It's been 13 years and I sure hope she is doing fine. Thanks for reading, Preethi. I have so much to say, but nothing that my mind can pause at for me to put here. Your post's gotten my mind running all over, thinking a thosand questions. I'm trying to but I cannot imagine what the girl muct have in her mind. Thanks for writing this. You're creating empathy - something that can do wonders and slowly change the world in its own way. Kudos. When you entered the class to teach them, you would'nt have imagined facing such a situation. I can imagine your shock, and the urge to help her out. I am sure Sapna would remember you for the way you cared. I hope and pray she is in safer circumstances now. I have a one-year old daughter ; I have started feeling the insecurity now. I have a 2 year old son, Sreeja, and I equally feel the anxiety. Your prayer is mine too. Thanks for stopping by. This is so shocking and a sad incident. You did the right thing and hope she is now in better hands. What the girl child had to go through was indeed painful and indecribably bad. Perhaps, we cannot even have the slightest idea of what mental and physical torture she must have had to bear because of filthy intentions of her father. Despite knowing this bitter fact i would reflect the light on helpless state of a mother. Just like her daughter she must have died each and everytime her daughter would have stretched her arms for help and she couldn't be of any. Holding back array of emotions, fear, regret and helplessness etc she might have cursed the very moment she gave birth to a girl child or married such a man. Ma'am this true story furiates readers like me and uncovers a sack full of emotions too. Although happy ending brings us back to peace in this case but leaves us in a deep thought about many such cases. You know, Bhavya, I have no idea if the ending of this one was a happy one. Who knows what transpired once the family was away from our eyes? Yes, makes me very angry too, and very scared that my child has to survive and live well in this kind of world. Thanks for leaving me with your valuable comment. Bhavya. I have tears in my eyes right now shuddering at the plight of that young girl. I pray she has recovered and lives a better life now. As for you, you deserve more than a pat on your back for your efforts.. Kudos Sakshi !! If you are HIV positive, you will be counseled and advised accordingly on how to lead a healthy life. Our essay help service enables you to produce a quality essay that reflects your personality and intellect. We understand how difficult it is to produce an essay that decides your fate. Just share your order details and hire essay writing help expert at cost effective rate now. professionals. While there are plenty of genuine assignment writing service companies in the country, the chances of landing on a fake or incompetent assignment help provider are not exactly slim.